Nitro brew energizes beverages with nitrogen while reducing carbonation. Although it is commonly associated with coffee – as in “nitro coffee” or “nitro brew coffee” – there are also a variety of other beverages that can be brewed with nitrogen, including beer, root beer, fruit drinks, and teas. The process of brewing nitrogen all begins with a mathematician by the name of Michael Ash, according to All About Beer Magazine. During the 1950s, Ash had been hired as the head of Guinness’ Sample Room, where 20 other brewers had been challenged with creating a more efficient system for draft beer in Ireland. Ash had considered nitrogen as a potential solution from the very beginning, however it would be years before him and a keg designer would design an efficient system for serving draft beer via nitrogen. Since then, nitrobrewing has been adapted for root beer, fruit drinks, teas, and most commonly: coffee. The origins of Nitro brew coffee are a bit fuzzy. However, Business Insider and Men’s Journal both credit Stumptown Coffee Roasters in Portland, OR, as one of the pioneers of the industry. In 2013, Stumptown Coffee Roasters began serving the rich, bold, nitro brew coffee. By April 2015, they began selling it by the can. Now, nitro brew coffee has become a commodity at national chains such as Starbucks and Dunkin Donuts. As of September 2017, it was a $738.1 million market, Statista reports. Nitro brew breathes life into your beverages by infusing nitrogen while simultaneously reducing the level of carbonation in less than 60 seconds. The bubbles from nitrogen are tiny, tight, stable, and consistent, in contrast with the effects of carbonation. This adorns nitro brew beverages their signature, picture-perfect layer of foam. More information about the NitroBrew process and its benefits are available on our website. From the moment your taste buds come in contact with your beer, coffee, or tea, you can tell instantly whether or not it’s been infused with nitrogen. It is bold, thick, rich, creamy, fizzy, chilling, and ultimately far more satisfying. Not only does it quench your thirst, but it’s consistency encourages you to take your time and truly revel in each sip. Regardless of your beverage of choice, you owe it to yourself to give nitro brew a taste. There really is nothing quite like it. The biggest difference among nitro brew, cold brew, and iced coffee is the texture. 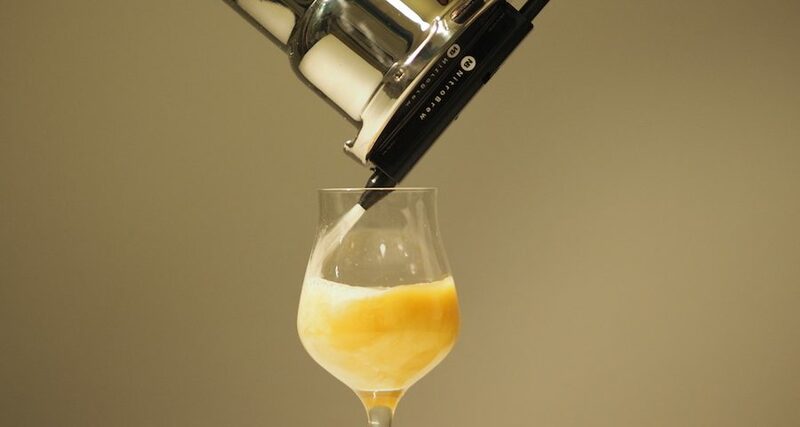 Nitro brew coffee is thick, foamy, and bubbly – much like a beer. Cold brew and iced coffee are much thinner. Both also lack what gives nitro brew coffee it’s signature experience: the foam and bubbles. As for flavor, nitro brew is definitely more robust. Cold brew coffee is steeped for hours in cool water, giving it a mild, sweet, consistent, and less acidic flavor. Iced coffee tastes very much like a standard cup of coffee, however the temperature gives it a smooth element, making it a bit easier to swallow than hot black coffee. Naturally, Iced coffee begins to taste diluted as the ice within the beverage begins to melt. Not only is nitro brew safe, it is actually better for you than standard beverages. It is less acidic, making it less harsh on your teeth and stomach. It’s lower levels of acidity also reduce the harsh, bitter taste associated with coffee and beer, making it “sweeter” without the use of any sweeteners. Nitro brew coffee also has higher levels of caffeine than a standard cup of coffee. Caffeine encourages digestion by boosting your metabolism, the American Journal of Physiology reports. Caffeine is also associated with an increase in focus and productivity (Coffee & Health), an increase in mood (Psychopharmacology), as well as a risk of developing type 2 diabetes (European Journal of Nutrition). On the flipside, too much caffeine can also have some negative side effects in those who are a bit more sensitive to the substance. The negative side effects include anxiety and sleep disorders, according to research published in Advances in Psychiatric Treatment. It is also a stimulant – like nicotine, amphetamines, and cocaine – which makes caffeine addictive, according to a research article published in Neuroscience & Biobehavioral Reviews. Generally speaking, yes. While prices will vary depending on where you go, nitrogen brewed beverages generally cost a dollar or two more than their counterpart. Don’t let this discourage you. For a little extra money out of pocket, you are treating yourself to a smoother, sweeter, frothier blend. Nitro brew beverages aren’t just beverages. They’re an experience. Alternatively, you can bring nitro brew coffee into the comfort of your home with our nitro coffee systems. You can enjoy NitroBrew whenever you want without sacrificing the additional surcharge of a traditional coffee shop or bar for just the one-time fee of one of our setups. Once you’ve got your own NitroBrew station at home, you can pull inspiration from and enjoy a variety of tutorials available on our YouTube channel. Who Should Try Nitro Brew? Everyone. Whether your life revolves around your morning cup o’ joe, a mid-afternoon tea, or like to unwind with a tall glass of beer at the end of the day, everyone deserves to try NitroBrew. Our kettles and kits can also make sodas and juices far more interesting and delectable for all walks of life. NitroBrew is delightful, rich, and satisfying. Not only will your taste buds thank you, but the rest of your body will, too. You can enjoy the drinks you already love with less acidity. It’s also a great dietary alternative to traditional coffee, as NitroBrews naturally thick and sweet taste will leave you less inclined to reach for creamer and sugar. The Nitro brew market is rapidly approaching a worth of $1 billion for a reason. There’s a reason consumers around the globe are willing to pay a little more for the coveted experience of a nitrobew beverage. If it weren’t a healthier and delicious alternative, the trend would have definitely fallen flat on its coaster by now. Nitro brew has withstood the test of time and the pallets of critics and casual coffee addicts from all around the world. It is our mission to deliver the unique, unbeatable quality of nitro brew straight to your home. Head on over to our blog for the latest tips, tricks, and trends of NitroBrew beverages.